Or even scarier: maybe that IS their smile. Haha, I just noticed the first comment on the article: "they do smile, when something goes wrong"
Except poland was never a part of soviet block, and polish people have very few in common with russians. thanks, bye. Oh, I love it so much when Polish people say they were never a part of the soviet block. You can always bet it's a Polish person when there's a conversation about any subject concerning the Soviet Union and out of the blue someone says "But Poland was never a part of the Soviet Union!" Well, I'm sorry this is the only cartoon here about Poland and that this is the only witty observation you were able to express about us. Not ALL Polish people! Just those four people, and that dog! That was quick! :) <-- smile! 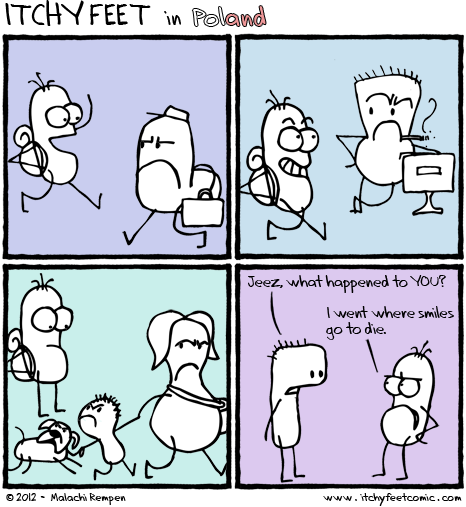 But... ok, I have to say this: whenever I come back to Poland from abroad I feel... like your cartoon. I am really surprised you mentioned the food! You can't imagine how many looks of disbelief I got from my foreign friends when I mentioned beetroot soup, marinated mushrooms or poultry gizzards in aspic... One Italian asked me why I would overcook spaghetti and put it into my tomato soup - well, thats what we do! Hell yeah! There's nothing better on a cold winter's day than some Polish soup. Warms the belly and scowls the jowl! It's difficult not to protest when Poland is made into an accomplice, and not a victim. We and Russians are sworn enemies! The day when they got rid of Poles from their throne is the greatest national day in Russia to this day - and the day when we got our freedom back from Russians is the greatest national day in Poland! I can also confirm that middle schoolers here are retards. Doctor: So, do you think you have a depression? Policeman: That's when you are more sad than the situation really is, right? No. I am exactly as depressed as the situation is. In fact, when I see someone who is smiling, I feel like to check him/her. That's already suspicious that they are happy in today's world. She was pointing out corruption etc. but I think it quite describes how do we think :D. You don't really need to frown, but rather to keep a serious face. If you would be smiling too much and expressing happiness, people could think you don't know how to behave on public, or that you are drunk, crazy etc. Smile is not by default, smile is for private use here! .. by "private" I mean it is something intimate. Happiness not an emotion we would share publicly, with strangers, that would marked us "naive" or silly. Like you don't share with people on bus what happened to you and your wife yesterday at bedroom, you don't share the happiness. You can do that if you are telling your friend though. Try to smile and look at people in Frown Block and you will terribly confuse them. They will think your smile has some purpose - that you are their friend, you want to tell something special etc. Some very negative people will even understad your smiling as mocking them. That's pretty intense...what happens when Frown Blockers travel to, like, Kenya, where everyone is smiling ALL the time? The youth usually enjoys that, come back and say: "Such a NICE country, people smile at you, everyone is happy! We, guys, should do the same!" and then they are smiling for next two months until the seriousness bury them back. Older people - Not sure, they usually describes such country very positively, but then I don't see they would be about to change themselves and realize they can smile more too. I still smile sometimes, but when doing that I avoid looking at people not to confuse them much. I am promoting the passive happiness. I smile at children openly though. (They seem to be confused too). A woman on the bus in Klaipeda, Lithuania told me that she knew i must be an american, because "men don't smile here." So THAT's why my Polish friend commented on "Americans and their everlasting smiles."